Canada Foreign Affairs Minister Chrystia Freeland: "This is a very intense moment in the negotiations." WASHINGTON (Reuters) - Talks between Canada and the United States intensified on Thursday as the two countries pushed to hammer out a deal on a revamped North American Free Trade Agreement by a Friday deadline, with both sides upbeat about the progress made so far. Despite some contentious issues still on the table, the increasingly positive tone contrasted with U.S. President Donald Trump’s harsh criticism of Canada in recent weeks, raising hopes that the year-long talks will conclude soon with a trilateral agreement. Negotiations entered a crucial phase this week after the United States and Mexico announced a bilateral deal on Monday, paving the way for Canada to rejoin talks to salvage the 24-year-old accord that accounts for over US$1 trillion in annual trade. 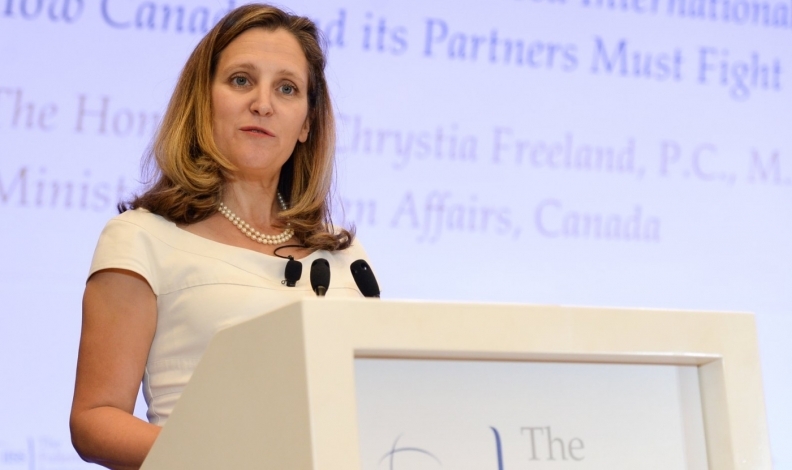 Negotiators worked late into Wednesday, officials said, and talks continued on Thursday between Canada’s lead negotiator, Foreign Minister Chrystia Freeland, and U.S. Trade Representative Robert Lighthizer. Trilateral talks are already underway at technical level and the U.S., Canadian and Mexican teams have been in touch in the past few days, according to two people familiar with the process. The ministers responsible were poised to meet, possibly as soon as Thursday, they added. New chapters governing the digital economy and stronger intellectual property, labor and environmental standards could also work to the benefit of U.S. companies, potentially helping Trump to fulfill his campaign promise of creating more American jobs. “We have had very intensive work being done by officials who were meeting late into the night last night on a number of different issues and I look forward to reviewing that work with Ambassador Lighthizer,” Freeland told reporters on Thursday. ‘There’s a lot of goodwill. It’s a lot that we’re trying to do in a short period of time, we’re working very very intensely,” she added. Trump and Canadian Prime Minister Justin Trudeau expressed optimism on Wednesday about reaching an agreement by Friday, although work remains on specific issues. Trudeau is expected to update premiers of Canadian provinces on Thursday on the progress of the talks. Trump also wants a NAFTA deal that eliminates dairy tariffs of up to 300 per cent that he argues are hurting U.S. farmers, an important political base for Republicans.